Jesus teaches his disciples to pray and tells them to ask, and they will receive, to knock, and the door will be opened to them. If they, who are sinful human beings, know how to give their children good gifts, how much more will their heavenly Father give the Holy Spirit to those who ask? The first portion of today’s Gospel contains the words of the prayer that many Christians know as “the Lord’s Prayer.” The first phrases are addressed to God as Father, a tender, caring parent who invites us to come close. They acknowledge God’s holiness: God’s divine nature is worthy of worship. God’s name (representative of God’s true character) is therefore “hallowed,” or revered, because it transcends our limited nature. The establishment of God’s kingdom is both the goal of prayer and the lens through which the remaining petitions are to be viewed. The second set of phrases are petitions for the needs of the community (us). Knowing God as one who provides manna in the wilderness (Exodus 16:1-35), we ask God as one who provides our daily bread for the journey. God’s forgiveness as reflected through Jesus (5:24, 7:48) must also be reflected through the people of God. We, who have already forgiven those indebted to us, ask God to forgive us. We pray also for God’s protection – to be led away from temptation, away from what would distort identity and purpose so as to remain faithful to our mission. Jesus’ resistance to temptation in the wilderness models for us true faithfulness to God’s purpose. There is an early Christian fresco painting in a family tomb located in a Roman catacomb. 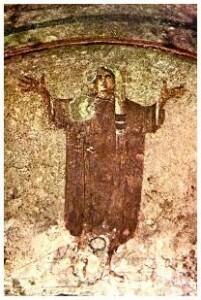 (Image above: orans posture – Catacombs of Priscilla, 3rd century AD) The central figure is in the early Christian stance of prayer, that is, standing, head upraised and eyes open, with arms outstretched and hands open with the palms upturned. In contrast to the more recent common position of bending over, with head bowed, eyes closed, and hands clasped, this position symbolically opens the one in prayer to the presence of God. The prayer Jesus taught the disciples calls for an openness to God. One might imagine Jesus and his followers standing together as they drew strength from God and each other. Prayer is a relationship built on confidence and trust. We may approach God in prayer as we would a good friend, confident of a response even at an inopportune time. Jesus recommends persistence based on trust and the expectation that God will respond. Who is the “us” referred to in Luke 11:3-4? Why do you think Jesus teaches prayer as a corporate discipline? What does this have to say about our own personal prayer life? What does it mean to you to address God as Father? What is our relationship with God and others as defined here? How is this prayer a model for Christian living? What special role does this prayer have in the life of the Church as well as in your own spiritual life? Describe the functions of asking, seeking, and knocking in our prayer life. How is the Holy Spirit involved (v. 13)? What do today’s other lessons tell us about our relationship to God? This entry was posted in Ordinary Time and tagged God, Jesus, Lord's Prayer, Luke. Bookmark the permalink.